A 64-year-old female operated 1 month previous for mitral valve repair presented with acute respiratory distress and dyspnea. Echocardiography showed large echogenic valvular mass measuring 2.3 × 1.3 cm with severe mitral regurgitation and dehiscence of the mitral ring posteriorly. The mass was attached subvalvularly to the ventricular septal-free wall and eroding through it, which required complete aggressive dissection of the infected tissues. Diagnosis was confirmed after resection of the valve by multiple negative blood cultures and positive valvular tissue for Aspergillus fumigatus endocarditis. She was treated with high dose of voriconazole for 3 months. Her postoperative period was complicated by acute-on-chronic renal failure. She responded very well to the management. Invasive cardiac aspergillosis is a severe and extremely life-threatening disease with a few reported cases. 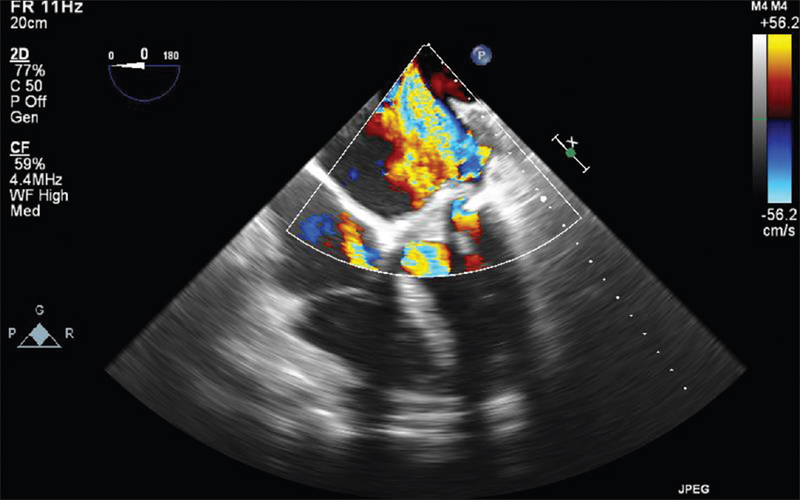 Fungal endocarditis results in echogenic large bulky valvular mass and it may present with acute left ventricular failure (LVF) and dyspnea. The diagnosis needs a high index of suspicion to correlate it with the corresponding echo results in patients who are likely to be infected. 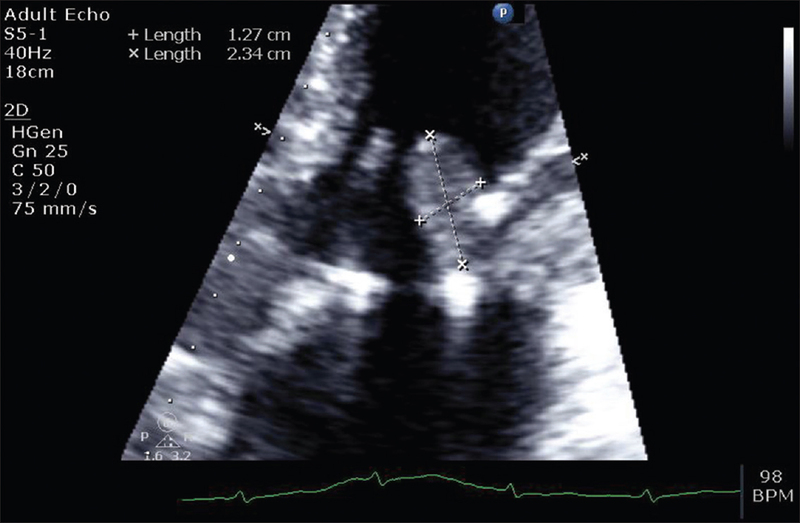 We present a case of an atypical early presentation of Aspergillus endocarditis (AE) with an echogenic valvular mass in a previously operated female for mitral valve repair. She was treated successfully with complete resection, valve replacement, and antifungal therapy. A 64-year-old female with multiple comorbidities of diabetes mellitus, hypertension, hypercholesterolemia, renal impairment, and rheumatic mitral valve disease; had recently undergone mitral valve and ascending aortic aneurysm repair electively, a month prior to her presentation. She presented to our emergency department in acute respiratory distress of a few hour's duration. Her preliminary clinical assessment revealed a distressed morbidly obese woman, unable to lie flat with a low oxygen saturation of 47% on room air. Her vital signs on presentation were: Temperature - 37.1°C; pulse - regular, 129 beat/min. ; blood pressure (BP) - 130/88 mmHg; and respiratory rate - 35/min. Chest examination showed decreased air entry bilaterally with scattered crepitations and wheezes. Cardiovascular exam showed normal S1, S2 with mitral regurgitation murmur grade 4/6 heard loudest at left midclavicular fifth intercostals space radiating to the axilla. Jugular venous pressure (JVP) was distended. Her peripheries were edematous and cool, but good capillary refill. Abdominal examination was unremarkable. She had no focal neurological deficit. Chest X-ray showed diffuse pulmonary congestion. Electrocardiogram (ECG) showed sinus tachycardia without significant changes. An urgent echocardiography revealed an echogenic mass attached to the posterior leaflet of the mitral valve measuring 2.3 cm × 1.3 cm [Figure 1] with a pulmonary artery pressure of 44 mmHg. The repaired mitral valve was seen in situ with a mean gradient of 12 mmHg with a mild mitral regurgitation. The estimated left ventricular ejection fraction was 60%. Her initial laboratory investigations showed a leukocyte of 26.5 × 10 9 /L, hemoglobin (Hb) - 11.3 g/dl, erythrocyte sedimentation rate (ESR): 75 mm/h, international normalized ratio (INR) - 3.28, urea - 14.4 mmol/l, creatinine: 288 mmol/l, B-type natriuretic peptide (BNP) - 23,300 IU. Multiple sets of blood cultures were sent. The patient was admitted for stabilization and initially managed conservatively as acute pulmonary edema secondary to acute prosthetic mitral valve thrombus. She was managed with antifailure medication and anticoagulation therapy with heparin. Despite therapy, her clinical condition deteriorated with compromising hemodynamics requiring inotropes. A subsequent echocardiography further showed a severe mitral regurgitation jet. A decision for an emergency redo sternotomy and mitral valve replacement was taken. Intraoperative transesophegeal echocardiography confirmed an echogenic mass on the prosthetic mitral valve with severe mitral regurgitation [Figure 2]. During surgery, the mitral valve was covered by an apparent layer of fibrinous tissue and old thrombi. There was a large mass on the ventricular surface of the mitral valve [Figure 3]. The annuloplasty ring was dehisced from the posterior leaflet annulus. The mass extended all along the posterior leaflet and was infiltrating into the annulus to the ventricular septal free wall. The valve was not suitable for repair. Full debridement was done and the valve was replaced with a CE Magna ease tissue valve, size 27 mm. She was sent back to cardiovascular intensive care unit (CICU) in a stable condition on minimal inotropic support. In CICU, empiric antimicrobial therapy (vancomycin and gentamycin) was initiated. A few days later, tissue valve culture report came back as Aspergillus fumigatus. Consequently, therapy was changed to intravenous voriconazole. She had a protracted, prolonged postoperative period complicated with acute on chronic renal failure requiring renal replacement therapy and subsequent upper gastrointestinal bleeding that was treated conservatively with proton pump inhibitors and blood transfusions. She was discharged in reasonably good condition and doing well afterward. AE is often caused by contamination during heart surgery, which we presume to be the case in this atypical early presentation of AE. The risk being particularly high when extracorporeal circulation is performed  and when valve replacement  or repair  is performed. In this case presentation, the patient had developed early fungal PVE within the 1 st month of surgery. This could be related mostly to the preexisting valvular disease or probably the contamination during heart surgery. PVE is categorized based on the temporal relationship of infection to surgery. Early infections occur within 60 days of surgery, while late PVE after 60 days. Fungal PVE can occur early or late, but is generally not seen early in the absence of preoperative fungal infection. In contrast to this case, she had presented as an early fungal PVE without any evidence of preoperative fungal infection. However, this patient remained afebrile throughout her primary postsurgical period. She had presented with a short history of breathlessness and diagnosed as acute LVF secondary to a large echogenic mass 2.0 cm × 1.5 cm obstructing the prosthetic repaired mitral valve detected by a transthoracic echocardiography. Initially, the mass was thought to be a thrombus formation, despite the patient being adequately anticoagulated on warfarin with an INR of 3.28. Faced with rapid clinical deterioration of this patient and based on the repeated echocardiography revealing development of severe mitral regurgitation, she was taken for emergency mitral valve replacement. Surgery not only provided therapy for the management of PVE but also provided tissue valve samples for definitive diagnosis through tissue cultures and histopathology. Surgery was the adjunctive tool of definite diagnosis as valve tissue samples were sent for culture and histopathology and has had therapeutic role in the management of PVE. The confirmed diagnosis relies on the evidence from the tissue culture. In conclusion, AE is a rare clinical entity related usually to a device or prosthesis. A high index of suspicion should be considered in patients with recent cardiothoracic surgery who presented early with acute heart failure. Echocardiographic assessment of suspected AE is critical. Early administration of appropriate antifungal treatment and prompt surgical intervention should improve the prognosis, which remains dismal. Attia RQ, Nowell JL, Roxburgh JC. Aspergillus endocarditis: A case of near complete left ventricular outflow obstruction. Interact Cardiovasc Thorac Surg 2012;14:894-6. Pierotti LC, Baddour LM. Fungal endocarditis, 1995-2000. Chest 2002;122:302-10. Ellis ME, Al-Abdely H, Sandridge A, Greer W, Ventura W. Fungal endocarditis: Evidence in the world literature, 1965-1995. Clin Infect Dis 2001;32:50-62. Newman WH, Cordell AR. Aspergillus endocarditis after open heart surgery. Report of a case and review of literature. J Thorac Cardiovasc Surg 1964;48:652-60. Stein PD, Harken DE, Dexter L. The nature and prevention of prosthetic valve endocarditis. Am Heart J 1966;71:393-407. Kuijer PM, Kuijper EJ, Van-der Tweel JG, Van-der-Lelie J. Aspergillus fumigatus, a rare cause of fatal coronary artery occlusion. Infection 1992;20:45-7. Mehta G. Aspergillus endocarditis after open heart surgery: An epidemiological investigation. J Hosp Infect 1990;15:245-53. Stavridis GT, Shabbo FP. Aspergillus prosthetic valve endocarditis. Eur J Cardiothorac Surg 1993;7:50-1. Wagner DK, Werner PH, Bonchek LI, Shimshack T, Rytel MW. Successful treatment of post-mitral valve annuloplasty Aspergillus flavus endocarditis. Am J Med 1985;79:777-80. Vongpatanasin W, Hillis LD, Lange RA. Prosthetic heart valves. N Engl J Med 1996;335:407-16. Rubinstein E, Lang R. Fungal endocarditis. Eur Heart J 1995;16(Suppl B):84-9. El-Hamamsy I, Dürrleman N, Stevens LM, Perrault LP, Carrier M. Aspergillus endocarditis after cardiac surgery. Ann Thorac Surg 2005;80:359-64.